We awoke to another warm morning, 14C (57F) and partly cloudy skies. We hiked through the campground to a guided trail workers used to get to work each morning 125 years ago. The trail was a 2+ km (1.2 mi) tote road up which the hundreds of railroad workers walked each morning and evening. The trail was informative and interesting, and ended at the upturned narrow gauge 1885 Baldwin steam engine and its tender car. 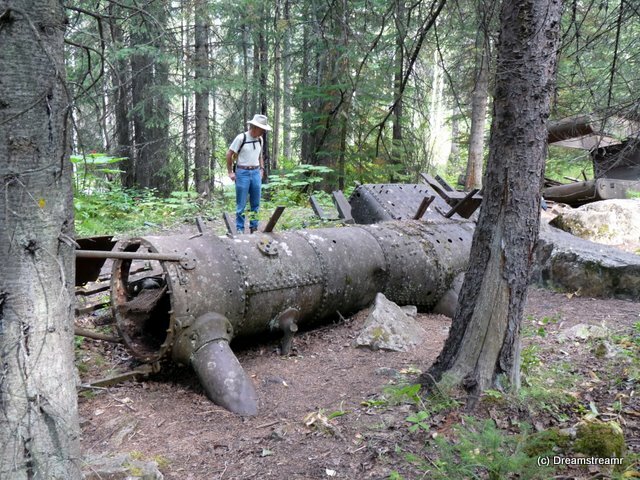 We were disappointed Canadian Pacific Railway didn’t think to upright and restore these two. They were one of two sets used in blasting the two spiral tunnels. The other engine was sold and this one was abandoned in place. 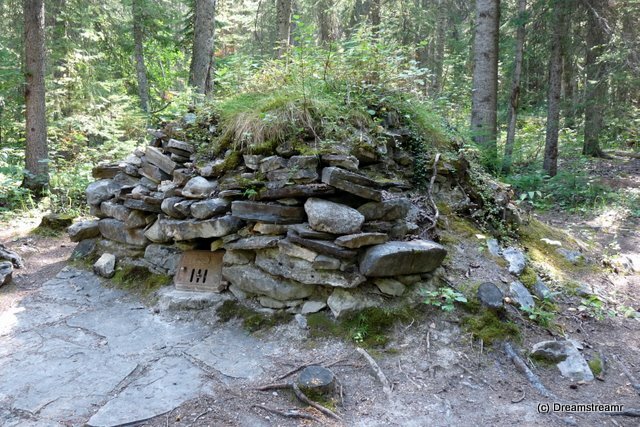 We returned to the campground and stumbled onto this cool (and slightly better preserved) relic, a bake oven from 1884-1885, when Kicking Horse Campground was the first railway work camp in the valley. Can you imagine bread baked in this? While there were certainly more elegant baking ovens in the east by 1884, we think the bread from this one would have tasted at least as good to the railway workers. Debbie packed a picnic lunch and we drove to Emerald Lake for a picnic. Parking was no problem, despite many cars and CruiseAmerica class-C’s in the parking lot. 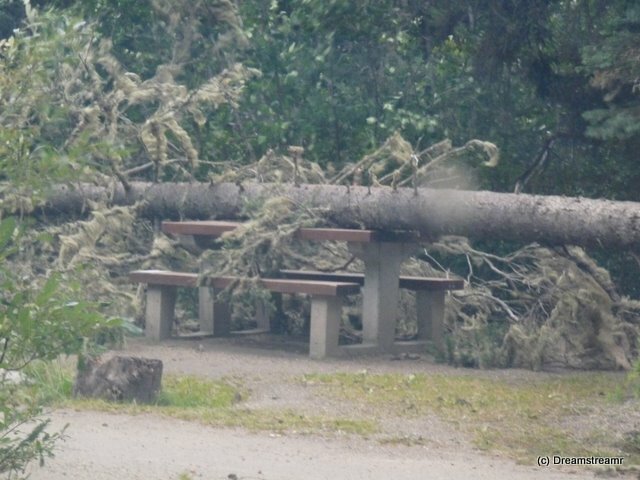 We walked 100 meters (325 ft) from the truck to a lakeside picnic table in partial shade. We returned our picnic supplies to the truck and started a short walk up into the Emerald Lake Resort and Conference Ctr, a set of wood framed and sided buildings tucked into the trees above the lake. Before we knew it, we had walked 5.2 kilometers (3.2 mi) around the lake. 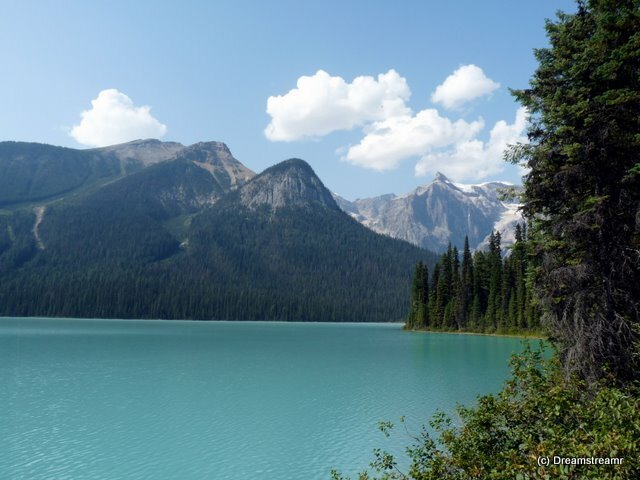 Yoho National Park has placed informative signs at 1 km spacing to describe the formation of the lake by glaciers, and the changes to the forest and lake over time. Beside our truck were two couples trying to perform a battery transplant on their rental class-c motorhome. The truck battery (supposed to start the engine) had apparently died, so they were going to switch the battery from the coach to start with. Jim offered to help them with our jumper cables. They recognized the cables but spoke almost zero English. They are from the Czech Republic. They started their rental motorhome without problem and we headed down the road. The number of people we’ve met on this trans-Canada tour with non-English or limited-English speaking has surprised us. We have met people from Czech Republic, Germany, Quebec. And then the couple from Scotland who spoke English (or is that Scottish?). We stopped to see Natural Bridge on the return trip to our campground. This is an interesting rock formation where the river has carved a tunnel through the rock. 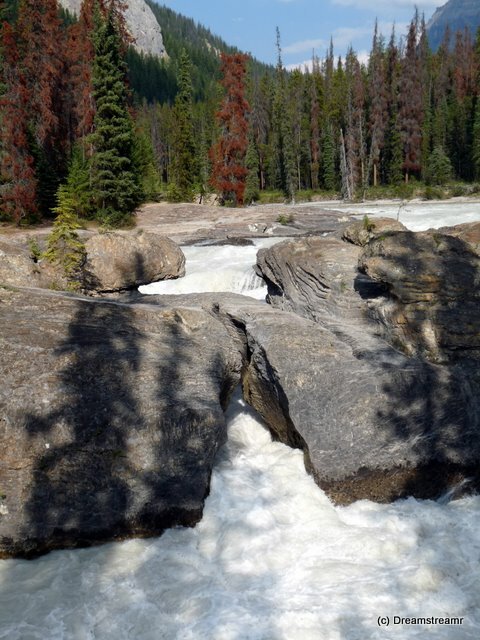 The carving is caused by abrasion from the large amount of limestone in the Kicking Horse River water, combined with sand and gravel carried by the rushing water. Previously most of the river water would cascade over the top of this large rock formation. A small lower hole through which some of the water would seep gradually became carved out, larger and larger, until most of the river flows through the hole. Only at peak flows does the water flow over the top also. Happy Birthday, Deb! Last night was our warmest in over a week, with the outside low temperature around 9 or 10C (50F). Jim awoke first to get Debbie’s presents and card out and make a pot of green tea. He tried boiling water in the kettle on the Primus stove outside and, after fiddling with it, taking apart a valve and replacing an o-ring, got it working very well. Jim is seriously out of practice doing much of anything more than boiling water or heating soup. Today is a time for change, if only for a day. Deb supervised Jim’s making breakfast, Debbie-style. Jim wouldn’t let Deb lift a finger but she was allowed to make suggestions if she wanted. And her direction was useful and appreciated. Result? A bacon, grits, and eggs breakfast with orange juice and hot tea. Deb opened her presents and card after breakfast and Jim washed and put away the dishes. Then we were off to Takakkaw Falls and other sites. Switchbacks are common enough in the Appalachian Mtns, and we have driven more than a few in the North Carolina sections. Maybe we’re out of practice? Jim missed the first one today, and reversed the truck and turned more sharply to negotiate this one. Okay, the drive up to Takakkaw Falls is a nice climb — almost 1,000 feet above our campsite. A loud roaring noise greeted us as we approached the Falls. 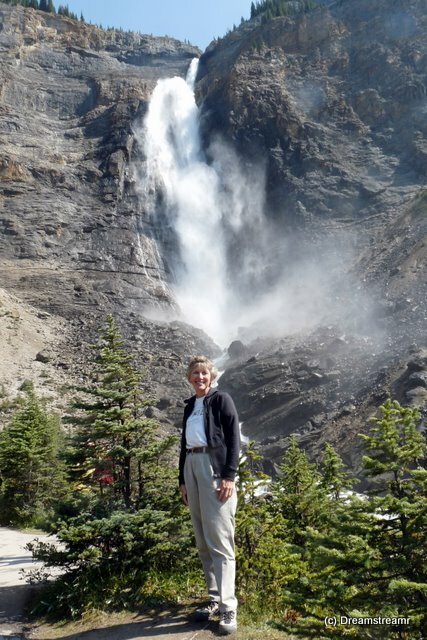 The Takakkaw Falls are 254 meters (825 feet) tall and astounding. An ice field refeeds the Daly Glacier, above the Falls. The glacial melt seasonally feeds the Falls in a crashing stream of water. The water falls 50 or 60 meters and hits a large pocket in the rock, exploding outward toward us and down. The cascade from the obstruction looks like it has been through an atomizing, or water-saving, shower head. We stood over fifty meters from the base and were sprinkled continuously by its mists. The Yoho spiral tunnels are an unequalled railway accomplishment in all of Canada. Canadian Pacific Railway (CPR) was, in the late 1870s, hurrying to complete the transcontinental railway to the Pacific. 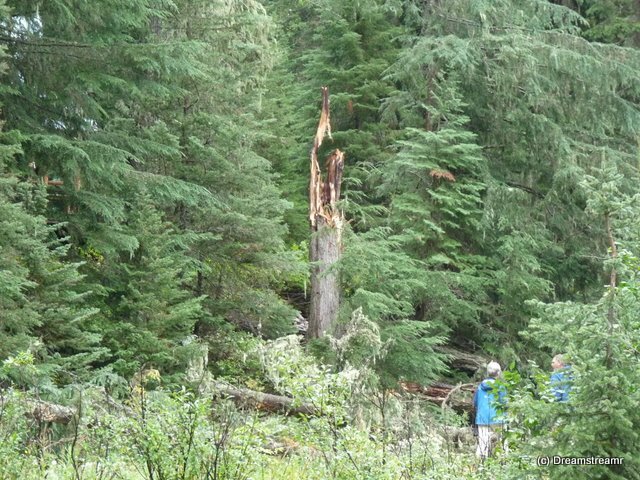 The Canadian Rockies presented a particular obstacle, and no low pass recommended itself. Lower passes were available but, no doubt for political reasons, CPR selected the Kicking Horse Pass for the crossing of the Rockies. Helpful too is the alignment of Kicking Horse Pass with Rogers Pass further to the West. CPR commenced to run the track right down the grade along the sides of the big mountains. The Big Hill, as the grade became known for at least the first twenty-five years, immediately proved deadly. The first train to hurtle down the newly installed track left the tracks and plunged into the creek at the bottom. All three on-board crew members died in the crash. CPR for twenty-five years operated the 4.5% grade (four times the continental average) as a temporary measure, with emergency spurs located strategically along the downward path. The grade is so steep the company maintained thirty-nine employees in nearby Field, B.C., to operate the special pusher engines to augment the train’s normal steam locomotives to help the trains up the grade. Heavy dining cars were not taken up the grade, so CPR built dining inns at the other side of the top of the pass for its passesngers. These inns became destinations in their own right, surviving the eventual dining cars arriving on the scene. CPR finally, in 1903, started designing a pair of 3/4 turn spiral tunnels carved entirely inside two adjacent mountains along the grade. Each of the spirals, each one kilometer (.62 miles) long, raises the track by 16 meters (51 feet). CPR and the Parks created a viewpoint along the Trans-Canada Highway #1 west of Kicking Horse Pass. Nice displays explain the problem, the solution, and the terrible costs endured. The blasting required 75 train carloads of explosive, 1,000 workers, and twenty months to complete. Sadly the dangerous work conditions and processes killed one worker each week. The tunnels opened 100 years ago and solved the grade problems by lengthening the climb by two kilometers (1.25 miles) and reducing the steepness of the grade. This allowed dining cars to be pulled up and trains to safely negotiate the downhill grade with greatly diminished runaway train dangers. 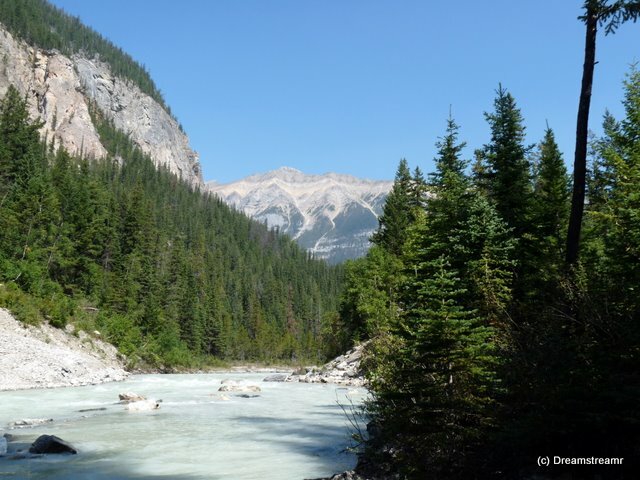 Field, B.C., exists only in support of CPR and the National Parks. And it is tiny. There might be one hundred houses in Field. There are, among the houses, eleven privately owned and operated bed and breakfasts. Almost every house sports a sizable stock of cut, split, dried, and stacked stovewood. And firewood piles are still being worked up today while we visited. The area does not look like it would be entirely hospitable in mid-winter. A bright spot, though, greets one as they enter the hamlet up the hill from the railroad crossing. The Park Superintendent’s house, built by the National Parks in 1920, looks pristine and imposing. The National Parks wanted to establish the Park Superintendent’s authority and visibility through the trappings of his quarters. The premise, according to the plaque in front of the house, was the Superintendent was dealing with mining and railway representatives. The finest house in the village would help establish the importance of the Park Superintendent. The Parks also designed the Superintendent’s house as a prototype for park architecture. The design appears to have worked, as the house looks like it has weathered ninety winters perfectly and may last another ninety if it is maintained as it has been so far. The first thing you notice is the roaring noise of Kicking Horse River, chock full of glacial melt from a warm couple of days. Then we noticed we hear nothing except the river. Well, almost nothing. There is a diesel Silverado in the next campsite and we can hear when he starts his engine. And we can hear the trains a kilometer away on the other side of this valley, as they labor up the grade to the spiral tunnels. None of the whisking by, whistles a’blowing, for these work trains. These are chugging, huge diesel engines growling their bass voices, as they pull their great loads up the grade. The river is not peaking but even in our first few hours in the Kicking Horse Campground in Yoho National Park we notice the water level rose at least half a foot. Deb walked down soon after we arrived and stepped onto a rock in the river so she could get a picture. The water showed the expected glacial blue color. We walked to the river together an hour later and the rock was completely covered. And the water has become milky white, apparently carrying an increased amount of glacially-ground stone dust. Our campsite is only twenty meters from the river’s edge and several meters above it. Our back window admits the river’s noise just as vividly as any of the windows admit daylight. Today is comfortably warm, almost 27C (80F). 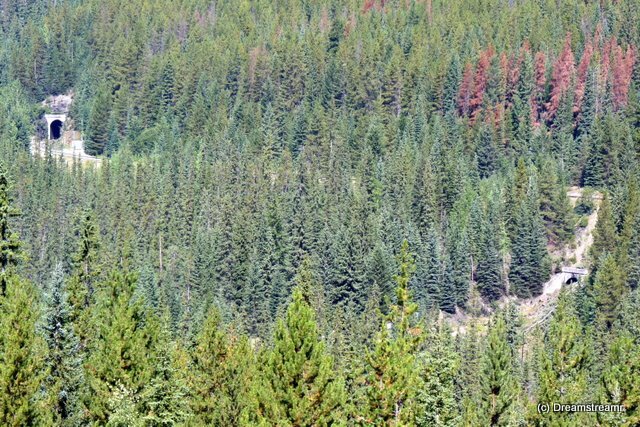 Kicking Horse Campground offers sites in shade or in sun. We have a mostly sunny site and can easily move our chairs in or out of the sunlight. Fortunately our solar panels catch adequate sunlight because no electrical service is available in the campground’s sites. The campground has at least six dining shelters, and they each have a pair of electric light bulbs in keyless (unswitched) sockets. 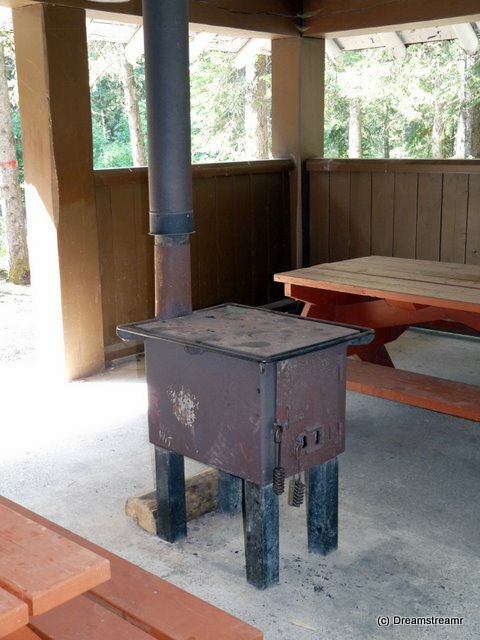 The dining shelters have wood stoves in them as well. The stoves are vented through the roof and firewood is free, so cooking for a group, small or large, would be easy to do. We thought the illuminated (and heated, after a fashion) shelters would be a great blessing for tent campers, particularly in wet weather. The lights stay on at all times, as do the lights in the several washrooms. We’ve heard these, probably with some water pumps, jointly contribute just enough load to keep the diesel generator working well. This is the second place this summer we’ve noticed a service area not served by the electrical grid. Funny to reflect on, how often do you visit places not at all served with electricity in the states? Hydroelectric generation would be a breeze here part of the year — the unfrozen part. But the electrical demand is probably small. What are a couple of dozen light bulbs, a few pumps, and a small office going to require, eight or ten kilowatts at peak? The park instead uses a mobile diesel-driven generator tucked in a corner of the campground. 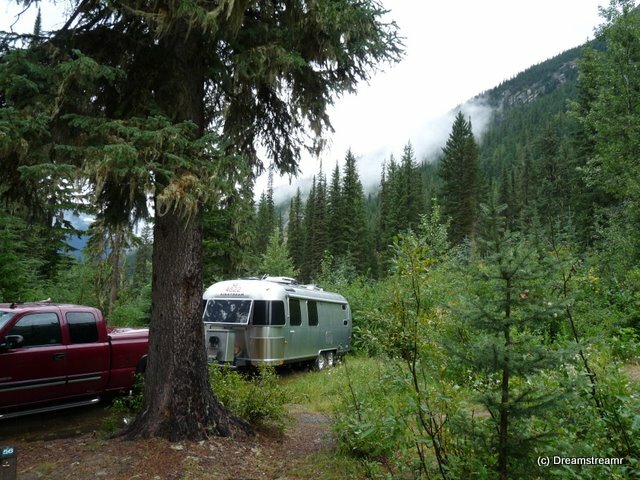 Do you think we hear the generator from our campsite, with the Kicking Horse River roaring nearby? 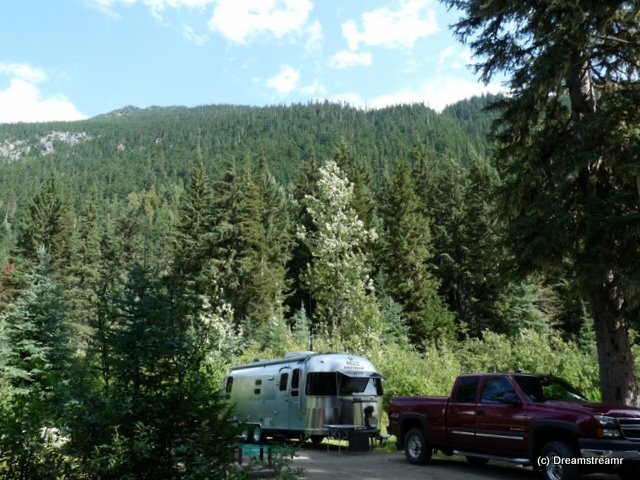 A walk around the campground reveals no other Airstreams, several 30-35 feet long motorhomes, a few tent trailers, a half-dozen B-vans (conversion vans), a dozen or more tents, and over a dozen CanaDream or CruiseAmerica rental class-C campers. We’ve noted before, I think, the rental units very frequently carry Europeans who have flown into Vancouver and are spending four to six weeks traveling western Canada. We bump into them constantly in the Canadian Rockies. Have you encountered them in the states? Almost certainly at Grand Canyon and Pikes Peak. This is one of the prettiest campgrounds we’ve visited. The sites are separated by wildflowers, low shrubs, and up to 30 meters distance. A nice stand of hardwoods and evergreens screens the camping loops from one another and provides partial shade. The campground driveways are paved. The washrooms and showers are very clean, if only a little rustic. 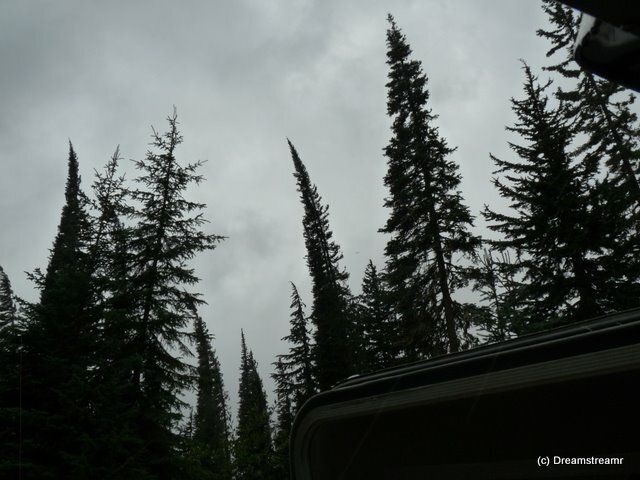 The tent sites are wonderful, tucked in amongst large trees and near a nice creek, Monarch Creek. 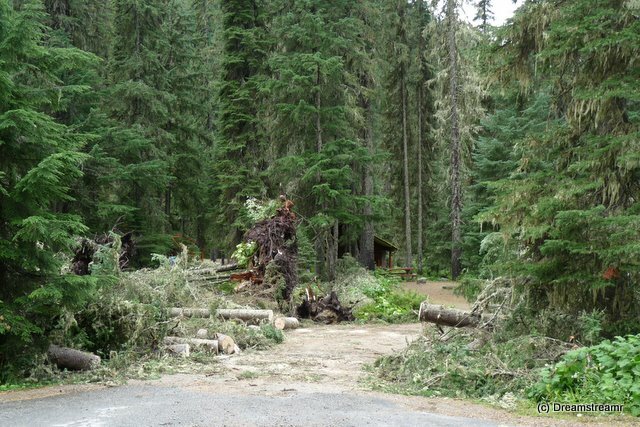 Nearby is another Yoho campground named Monarch. 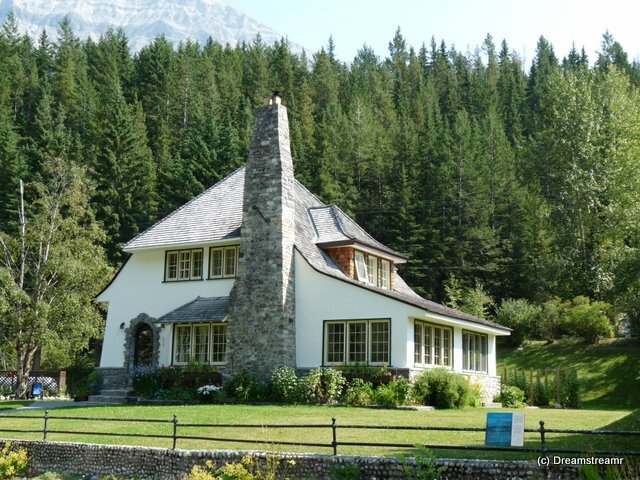 It is a flat spot of grass and bushes with dirt driveways, visible from Highway 1, beside the road to Takakkaw Falls. Monarch is incredibly dusty, very exposed to the highway traffic noises, and just not appealing except for the $17/night price. 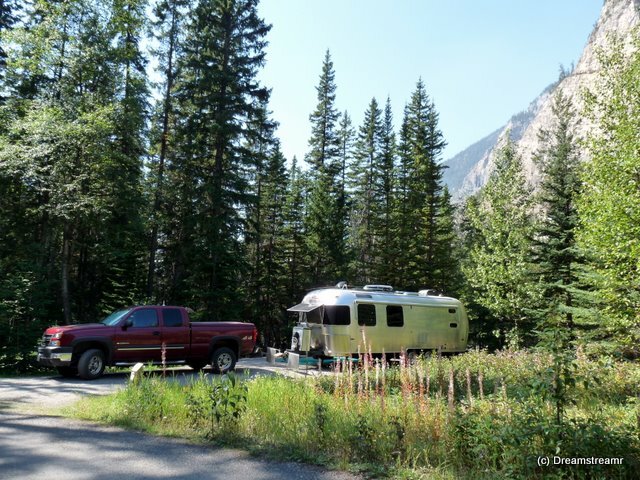 Luckily we decided to look further up the Takkakaw Falls road and found this beautiful spot, Kicking Horse Campground. Let’s stay awhile, okay?